I have been enduring wearing my eyeglasses with high grade (for both eyes) since time immemorial (lol). Since during “those times”, there is no definite cure for this condition; I can do nothing about it but to accept the fact that I will be wearing my spectacles for as long as forever. 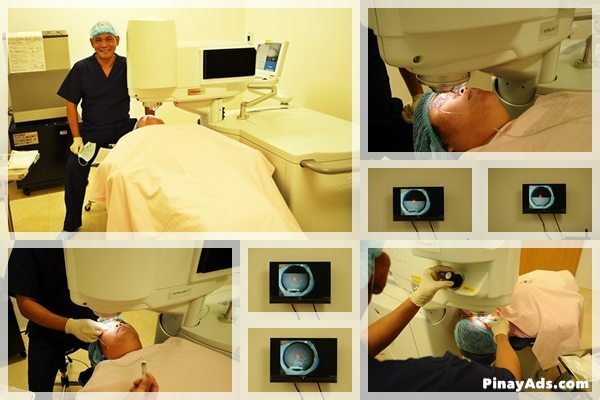 Good thing, LASIK (laser-assisted in situ keratomileusis) surgery, commonly referred to as laser eye surgery, has reached the country and I was able to try it and proved that this kind of surgery really works! LASIK is a type of refractive surgery for the correction of several eye conditions such as myopia, hyperopia, and astigmatism. 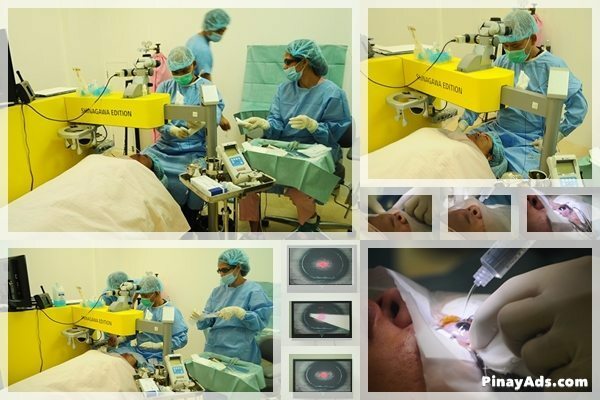 It is performed by a trained ophthalmologist using a laser. Anyway, remember last time where I accompanied one of my friends, Mitch, when she underwent a LASIK surgery, too! I was really curious and tempted at the same time to also try the procedure but I guess I was not just ready yet or perhaps I was just overpowered by my fear – fear for the surgery itself. Months after the procedure, I have learned that the procedure was indeed a success and that Mitch is now “enjoying her life” without her eyeglasses. Because of this, I know I have to overcome my fears and that I really have to try LASIK surgery so as to improve my vision and of course, get rid of these glasses that have been clinging to me ever since. 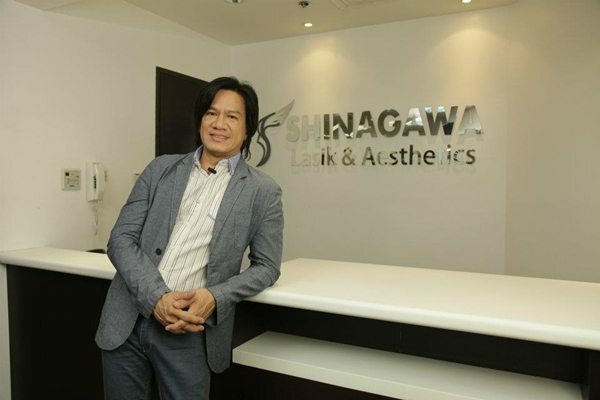 Good thing, Shinagawa Lasik and Aesthetics Center located at Makati has their “LASIK BUNDLE PROMO“; 2 persons can undergo LASIK procedure for only P89,600 – 2 PERSONS FOR THE PRICE OF 1! So, I decided to visit the clinic and had my eyes screened. When I was there, I noticed that there were a number of machines used to screen their patients. I guess the purpose is to make sure that they will obtain accurate results. 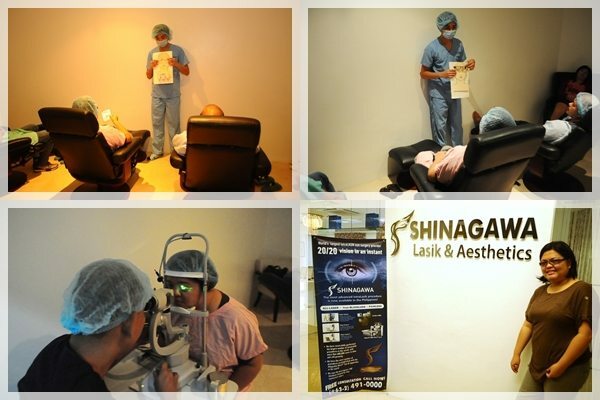 Based on my “little research”, several celebrities have undergone LASIK surgery from Shinagawa and that they were really satisfied with the results. Some of these celebrities were Joey Generoso (Side A Band), Ariel Rivera (Singer/Actor) and Janice de Belen, among others. To see the complete list of satisfied celebrities and patients, together with their corresponding testimonials. Anyway, to make the long story short, I underwent the screening to know if I can qualify for the actual LASIK procedure. Dra. Samson was the one who screened me and it was done in two rooms, they call them the bright room and the dark room. The screening process took almost 2 hours because I have to go through several machines and undergo a rigid screening to make sure that the result will be a success. I arrived around 1:30 in the afternoon and the screening tests ended around 4:30PM. Actually, it lasted that long because there was one procedure that was done again to make sure that they obtain the right grades of my eyes. They administered eye drops and waited for 30 minutes to properly dilate my pupils to temporarily paralyze the autofocus of my eyes during the screening process. I have experienced the Shinagawa’s 5 ways to check the eye grade; another 4 to 5 ways to check for the cornea thickness called the Corneal pachymetry using the machine called pachymeter, as well as, the 5 to 7 steps/ways to determine the topography or shape of the cornea to make sure that there will be no complications during and after the actual process. I should also say that although they are using sophisticated machines to check the eyes, they still do the manual procedures, as well. Shinagawa also uses the “Landolt C” Chart (Japanese Vision Test) instead of using the usual eye chart, the Snellen chart. In some of the screening processes, I can sense that some instruments or machine parts are somewhat touching my eyes, but there’s no pain because of the eye drops they have administered before the procedure. When the elaborate screening process was done Dr. Guerero explained to me the Intra LASIK surgery and assured me that it will be painless. Because I really felt brave that time, I scheduled myself for a surgery. I was given a piece of paper where reminders and other important surgical precautions were printed. Actually, it was a 5-page leaflet where every pertinent question regarding the LASIK surgery is answered. I also read the overview of the Intra LASIK process, the do’s and don’ts before and after the procedure, as well as, what to expect during and after procedure. On a scheduled date, I drag my husband with me to give me “words of encouragement”, moral support or whatever it is he can give to shake off those anxieties that I was feeling. I’d be hypocrite if I tell you that I felt just fine. Although, some of my friends discouraged me to undergo this procedure, still I ignored them because I’m really determined this time, plus the fact that Mitch told me that after several months, she is feeling great and having a positive experience with regards to the procedure she has undergone. When I was at the Shinagawa, I waited for a moment and when my name was called, I realized that there were 5 of us. We were told to enter the recovery room, changed our clothes to a scrub suit then wore the provided slippers. Three (3) eye drops were administered to each of us – the anesthetic, the antiflamatory and the antibiotic eye drops. After a few seconds, I felt numbness in my eyes and I was told that it was normal (due to anesthetic drops). Inside the room, we were informed that during the procedure, we have to keep our eyes open for about 31 seconds, even blinking is discouraged. Because I really want this to work out, I practiced – I mean trying to keep my eyes open for about 31 seconds or so. I thought it was hard, but it’s really easy! Anyway, when my name was called (again), I was instructed to enter a certain room where the FLAP procedure will be done. In this procedure, I was told to focus my vision on the red dot in front of me without blinking during the process. I kept each of my eye open during the process for about 31 seconds (as we were told earlier). After that, I was directed to another room called Excimer room. In this room, the actual INTRA LASIK surgery will be performed. During the actual procedure, I have to focus my vision on the blinking green lights in front of me without moving. In less than 15 minutes, it was done and voila! That fast. Really! I must say that Dr. Guerrero, the surgeon who performed the procedure, was very nice and that he constantly reminded me on what to do while he was performing the procedure. I also would like to thank him for allowing my husband to take pictures during the procedure as normally, they really do not allow it, but since I told him that I will blog about it, they allowed the picture-taking. After the surgery, I was instructed to return to the recovery room. Inside the room, I was instructed to close my eyes for a while then the surgeon checked them and told me to check the wall clock. I was really surprised that I can tell time, not that I don’t know how to (lol). Seriously, I was really amazed that I can see the clock’s hands without my glasses! I was overwhelmed! After that, one of the staff handed me 3 eye drops together with a mefenamic acid, protective shades, eye shield and 3m tape. The first 2 drops was to be administered every 3 hours while the other one will be put when there is a feeling of “dry eyes”. I was also advised to take Mefenamic after 2 hours just in case I felt pain when the effect of anesthesia has subsided. Luckily, I didn’t feel any pain after, although 30 minutes after the surgery, I was having a difficulty opening both of my eyes or I felt like they’re zooming in whenever I try to focus on an object. So, I decided to take a nap while my husband drove me home. When I woke up, everything went back to normal, except that I don’t have my old glasses anymore, just the protective shades that was handed to me at the clinic. I was scheduled for a check-up the next day so I went back to Shinagawa. Optometrist Tito Arevalo brought me to the bright room to check my eye grades and instructed me to read the Landolt C chart. You know, before the surgery, I find it hard to read when I’m on the 5th row of the chart, but during that time (a day after the procedure) it was no sweat reading up to the 2nd to the last row. According to Dr. Arevalo, my vision is now 20/12, which is way better than the normal 20/20 vision! Imagine?! After that, I went to the surgeon, since Dr. Guerrero was not around that day, Dr. Dinglasan was assigned to do the necessary check-up. I waited for Dr. Dinglasan for a while since he was still inside the surgery room. While waiting, Opto Tito stayed with me and entertained my questions. He explained to me the purpose of each machine that were used to me during the surgery. He also added that a very low percentage, about 1-2% of patients, do not pass the preliminary tests for LASIK surgery, which included patients with cataract and other similar eye conditions. He likewise mentioned that it is normal to experience something like a glare or haze after the surgery, as well as, seeing blurred when an object is near and seeing clearly when they are far. 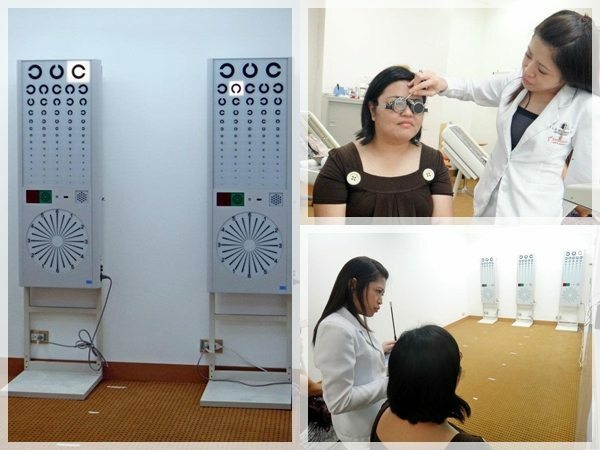 He added that their clinic is open from Mondays to Sundays and that patients who want to undergo LASIK surgery should get a schedule because there were really times that they have numerous patients in a day. After sometime, Dr. Dinglasan called me, checked my eyes and told me that my eyes are positively responding to the procedure. He also reduced the frequency of the drops from every 3 hours to every 4 hours. After that I was scheduled for my 2nd follow-up check-up a week after. 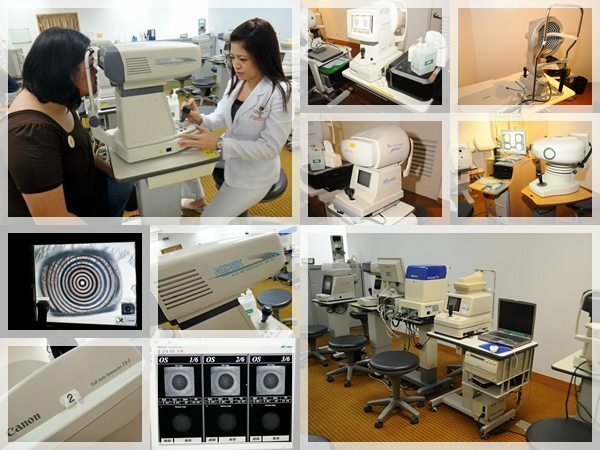 • They have the highest number of procedures performed with the ALLEGRETTO WAVE Eye-Q Lasik in the world. With Shinagawa LASIK, it’s safe, bladeless, and painless. For inquiries, please visit http://shinagawa.ph, call their hotline at (632) 491.000 or email inquiry@shinagawa.ph. Follow them on Twitter and like their Facebook page to be updated about their promos and new offerings. Thanks to my friend, Jen Aspacio of KikayCorner.net, for the pre-screening photos. Congrats on having a successful Lasik surgery, Iris! 🙂 I’m sure you’re appreciating the world a lot differently now that you don’t need your eyeglasses just to tell the time. A breakthrough in medicine is what this is. And I’m sure a lot of people will benefit from having clearer vision because it is definitely needed in our everyday life. Wow, that looked scary! But it’s good to now that you’re now enjoying perfect vision. I, on the other hand, have to wait for a higher eye grade before I can undergo LASIK. wow! 20/12! bongga better than 20/20 nga. di ba masaket or no discomfort after and how.do u feel now no itchiness, redness, swelling and other unuusual stuff? congrats btw for ur new set of beautifil eyes! Very detailed blog. Thanks. What does Shinagawa mean? After surgery, are there any restrictions regarding washing the face or swimming? Shinagawa is a place in Tokyo, Japan. And The Shinagawa Clinic Group of Companies is the biggest and No. 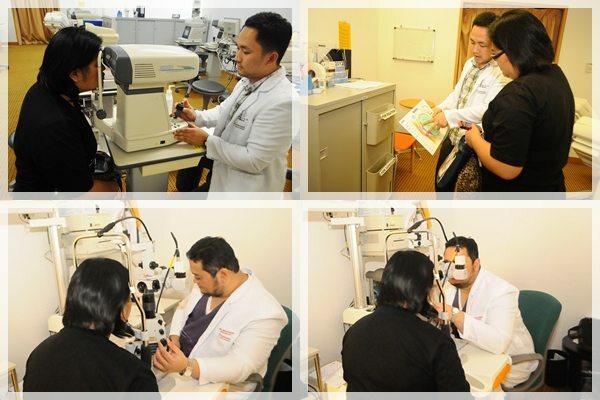 1 eye laser and aesthetic center in Japan. It aims to bring the first-ever Japanese medical technology to the country. Regarding the restrictions, prevent water from entering your eyes for at least a week after LASIK.Avoid rubbing your eyes for at least the first week. No swimming for a month or 2, depending on your surgeon’s advice. The eye surgeons here were also trained in Japan? Did they say if there is an age limit when you are too old for this procedure? Yes Fred, the surgeons were sent to Japan for training. 1. Have a stable refraction (spectacle power) at least a year. 3. Not pregnant or breasfeeding. 4. No medical illnesses such as diabetes, rheumatoid arthritis, AIDS, Sjorgen disease, or any other illnesses that may affect the healing process that will result to a bad outcome..
6. Have sufficient corneal thickness (the cornea is the transparent front part of the eye). A LASIK patient should have a cornea that is thick enough to allow the surgeon to safely create a clean corneal flap of appropriate depth. Thanks Gessa, yup I can wear sunglasses and makeup na rin hahahaha! thanks for this very comprehensive post. my daughter wants a lasik procedure but she is only fourteen. we’re considering it in the future, when she is ready enough to handle such procedure. she’s wearing contacts almost everyday, and her vision is 200/325..
congrats and wow to your 20/12 vision.. I remember when my daughter had her first contacts and she would sing, “I can see clearly now” without the glasses.” now I am looking forward to that day when she would sing with 20/12 vision too, with the lasik. 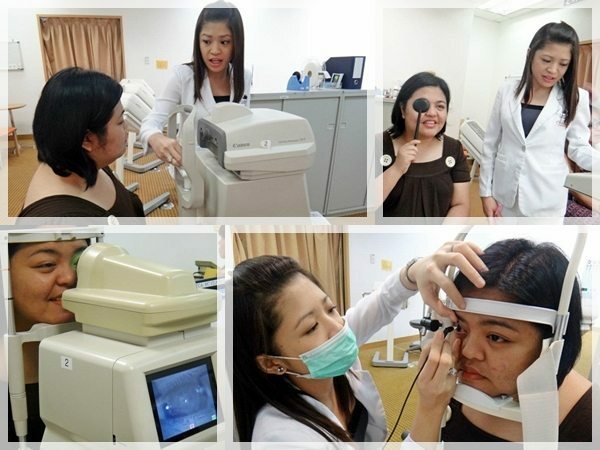 Get rid of your eyeglasses and have the 20/20 vision again..LASIK surgery is really painless! I’ve been wanting to get LASIK Surgery but I’m not qualified. 🙁 I have 125/175 and 225 astigmastism.